Health care is on voters’ minds. Policymakers across the political spectrum have taken note, agreeing on the importance of universal access to health care. Unfortunately, some think we already have universal access. President Bush told us just last year that "people have access to health care in America," repeating one of the most insidious myths about the American health care system. 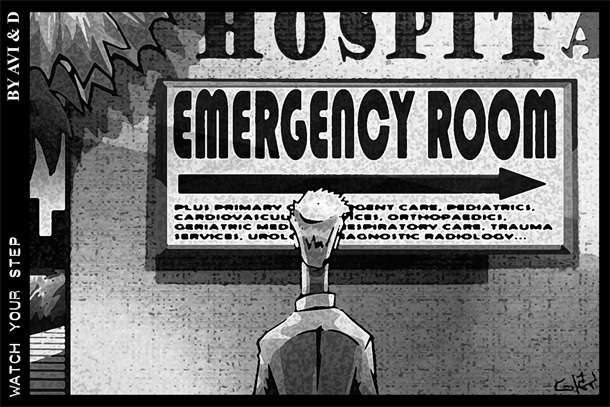 "After all," he said, "you just go to an emergency room." Access to emergency room care is not the same as access to comprehensive, coordinated, and timely health care services—the kind of care that coverage facilitates. We know that coverage matters. Uninsured individuals experience delayed diagnoses, are less likely to receive recommended care for chronic conditions, and are less likely to be admitted to a hospital when they experience trauma. Others think we already have done enough to make health coverage accessible. 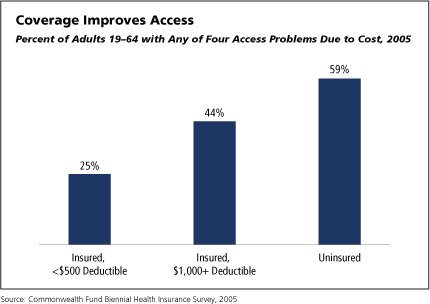 A conservative economist recently wrote that, "access to insurance is already guaranteed." Certain already-insured people must be offered coverage when they switch from group to individual coverage, but not at a reasonable price. Over 70 percent of individuals in poor health found it very difficult or impossible to find affordable, individual-market coverage. Others think that universal access can be achieved through reform proposals that provide tax credits for health coverage alone. Fixed-dollar tax credits may actually help healthy individuals, who can find coverage with low premiums. But for people with health problems, and for low-income Americans, only a very generous voucher—far more generous than anything that has been proposed—could make health coverage affordable under a market-based reform proposal. Coverage itself does not guarantee access to care. When faced with tax credits that are too small to purchase comprehensive health insurance, some individuals and families may opt for high-deductible policies paired with health savings accounts. These plans frequently do not cover preventive care or the routine care necessary for managing chronic conditions like diabetes and asthma. People who hold these policies are 50 percent more likely to report access problems related to cost, while people with chronic health problems are particularly affected by the poor coverage offered by these policies. The status quo fails to give Americans either acceptable access to health care or affordable, guaranteed health coverage. Some current proposals could even make matters worse. Neither care without coverage, nor coverage without access to care, will meet our nation’s needs. S. Benan, "After All, You Just Go to an Emergency Room," The Carpetbagger Report, July 11, 2007. N.T Connally, "When Doctors Lose Patience," Washington Monthly, July 11, 2007. P. Longman, "Best Care Everywhere," Washington Monthly, October 2007. J.R. Lu and W. Hsiao, "Does Universal Health Insurance Make Health Care Unaffordable? Lessons From Taiwan," Health Affairs 22 (3) (2003) : 77-88. Defining the term health care "access" has sparked intense debates among both health care practitioners and policymakers. Access can be framed along ethical, legal, or economic lines, so the extent of the access problem and its solutions differ depending upon the definition. Some suggest that we have no problem; others call it one of the most serious problems facing our nation. The Institute of Medicine, a non-partisan research organization, has performed extensive research on the subject. It defines access as "the timely use of personal health services to achieve the best possible health outcomes" and has concluded that lack of access to health care is a major problem. There are four dimensions that we should consider when evaluating access issues: the content of care, financial barriers to access, physical barriers to access, and socio-demographic barriers to access. 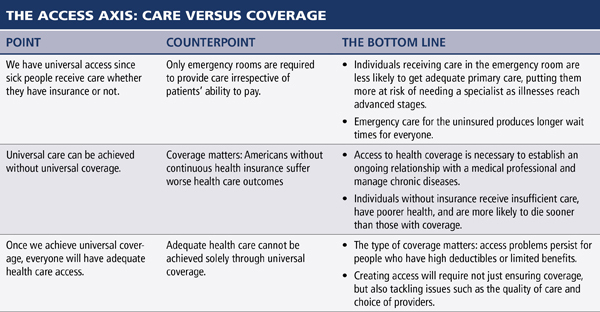 Content of Care: Federal law requires that every American have access to emergency care. 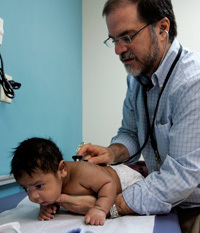 There are also public hospitals and clinics that provide free or low-cost care. Yet most of these sites, particularly emergency rooms, are not designed to provide comprehensive care. And we know that the health care safety net is not a substitute for complete health coverage. Financial Barriers to Access: Inadequate financial resources restrict and delay access to basic health care services for 47 million uninsured, as well as a countless number of underinsured Americans. Research clearly indicates that the uninsured population receives less care for necessary medical services compared to the insured population. But having insurance is not the only measure of financial access. Health plans with high deductibles and co-pays, which are common among the underinsured, provide little financial support for serious illnesses and place financial stress on families. 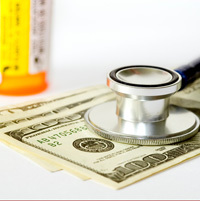 Health-related cost is the leading cause for personal bankruptcy in the United States. Physical Barriers to Access: Financial access may be meaningless if it is not complemented by physical access to the health care system. Physical access is defined as one’s ability to receive necessary medical services within a reasonable geographic proximity. Barriers to physical access are present throughout the nation, but are most pronounced in rural areas. On average, rural areas have proportionately fewer health care professionals, medical specialists, and high-tech equipment compared to non-rural regions. Geographical barriers, such as travel time to medical facilities, are also a significant limitation to physical access. For example, lack of safe transportation in inner-cities can bar people from seeking needed health services. Socio-Demographic Barriers to Access: In a diverse nation such as ours, it is important that the health care system be open and accessible to all people across income, gender, race, and other cultural dimensions. A recent article in the New York Times publicized government research that shows there are growing inequities in life expectancy between wealthy and poor Americans. There is also evidence that differences in access to the health care system contribute to health disparities along racial and ethnic lines. Hispanics and African Americans, for example, receive more medical services in emergency rooms and are less likely to have a regular primary care provider when compared to whites. Institute of Medicine. Consequences of Uninsurance Project Reports. October 11, 2001 through January 14, 2004. J. Hadley, "Insurance Coverage, Medical Care Use, and Short-Term Health Changes Following an Unintended Injury or the Onset of a Chronic Condition," JAMA 297 (10) (2007): 1073-1084. J.L. Hargraves and J. Hadley, "The contribution of insurance coverage and community resources to reducing racial/ethnic disparities in access to care," Health Services Research, June 2003.